Every Thursday Sahara’s van takes the kid’s to Decathlon. We left for Decathlon at 9 am and returned at 10:45am care home it was a good day trip. On the 7th of June Sahara kids at Decathlon On the 5th June Sports equipment for kids in Sahara .We left for Decathlon at 9 am and returned at 10:45am care home it was a good day trip. 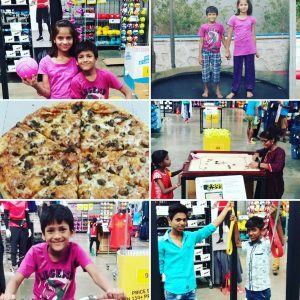 The kids got the opportunity to play a few sports and have some fun at the same time. Through sports one can learn vital life skills for example motivation, self discipline etc. Making a difference through sports is what Sahara wants to do. 28th May-The kids want pizza, so pizza it is.